I’ve seen this before, but was reminded via onegoodmove (who was reminded via Jerry Coyne). Â It’s pretty much spot on, though I doubt if those arguing for the existence of God would agree. What follows is a good example of why my daughter rocks. She and I drove by a church today that frequently has "witty" sayings on their sign. This week, the sign said, "Did you make God smile today?" I pointed it out to my daughter, but she missed it. "What did it say?" she asked. "It said, ‘Did you make God smile today?’"
She paused and asked, "How would you know?" I just watched a video about a car accident victim, his accompanying horrifying injuries, and his subsequent recovery. The injuries were so bad that the ICU had to put him into a chemically-induced coma for six and a half weeks. The medical staff patched him back up, fixing shattered joints, a fractured spine, dislocations, and lacerations on internal organs, among other horrors. After recovery, there was no paralysis and everything was healing well… an amazing recovery. So after over 8 weeks of constant medical care by a superb team of doctors, surgeons, nurses, and technicians, who gets the credit for the recovery? Here’s a hint. The soundtrack accompanying the video is the song “I Have To Believe” by Rita Springer. Don’t get me wrong. I have overwhelming sympathy for what the victim had to endure. I can’t even imagine the nightmare scenario of enduring that kind of physical trauma and the succeeding physical therapy. I cringed (and got a little choked up) when the video mentioned that the kids finally got to see their father after he woke up from the coma. However, I have an overwhelming feeling of disgust for the insensitivity and disregard for the monumentally heroic efforts by all the medical personnel who actually made the recovery possible. I’d guess that perhaps the family thanked the staff in person, but to then create a “tribute” video and make the claim that God did the work? …with no mention at all of the amazing people who actually saved the victim’s life, patched him up, and made his body functional again? That is hideous, ignorant behavior. I was browsing Netflix offerings this evening, specifically the streamable movies, and when you add a movie to your queue, Netflix presents a screen with recommendations for other similar movies. I had added the movie Waiting for Armageddon, a documentary about evangelical Christians who believe the end times are near. 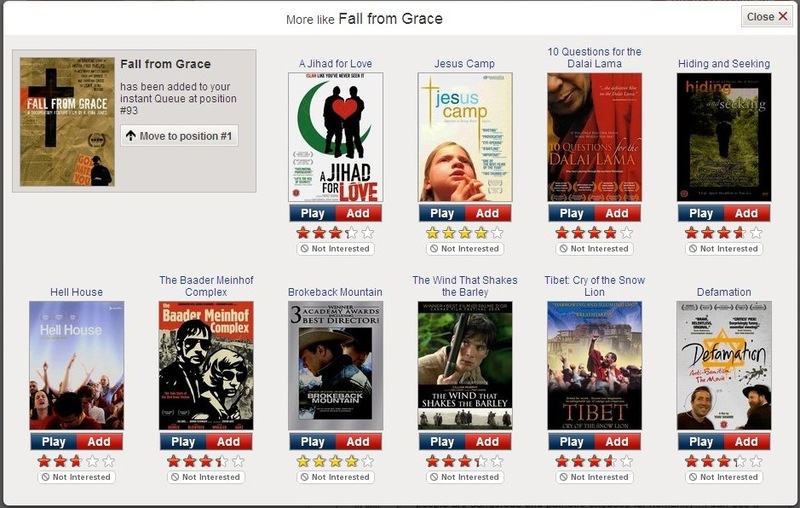 The resulting screen led me to add Fall from Grace, a documentary about the Westboro Baptist Church, Fred Phelps’ vehicle for spreading bigotry and hatred. 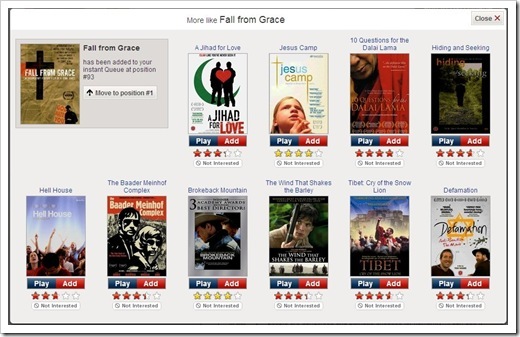 The resulting recommendation screen can be seen below. I scanned the results, paused, and laughed out loud when I got to the third movie in the second row (click to embiggen). Yeah. If I was putting together a list of movies in the "More like Fall from Grace" category, I don’t think Brokeback Mountain would be on it. I’m fairly certain it’s not a documentary, either. Lately, I’ve been hearing more and more stories in the news and on blogs about religious people speaking out on quite a few topics… from a religious standpoint. Whether the topic is competing religions, education, church-state separation, politics, science, or human rights, it seems that religious folks, be they Protestant, Muslim, Jewish, Catholic, Mormon, or some offshoot, seem to feel that they have sole access to universal truths and anyone who disagrees with them is immoral, unpatriotic, or just plain evil. Some Christians in the United States are frequently lamenting how they are persecuted… how their religious rights are being curtailed… how their freedom to worship is being stripped away… how their religion is prohibited in any public setting. Many Muslims seem to spew outrage over words and pictures they feel disrespect their beliefs… over opposition to their teachings… over perceived persecution or unfair treatment. Yet, at the same time, these religious people will attempt to push their beliefs into public policy, into education, into government… all the while seemingly completely unaware of their own hypocrisy; not seeing how their adamant proclamations of superiority are exactly the same as the adamant proclamations of competing religious claims. Why is that? How is it that some religious people seem completely closed off to the very notion that there are competing ideologies? How is it that some religious people will dismiss conflicting ideological claims without even the passing wonder if their own claims could just as easily be dismissed? How is it that one argument can be discarded as absurd when referring to one religion but that same argument can be held in high regard when referring to another? 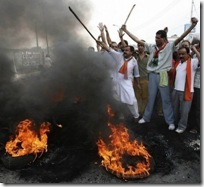 Why does religion seem to generate so much unrest… so much controversy… so much intolerance? I’ve created a partial list of ideas with my interpretation of each one. It is by no means complete, nor is it absolute. Based on what I’ve seen, heard, read, and experienced, this is simply my understanding about some of the consequences of religious teachings and religious beliefs. Feel free to correct, debate, or add to any and all of my points. Religion teaches to be satisfied with not understanding. This is one of the most pervasive problems with religions, in my opinion, and it’s always been a problem. If there is a phenomenon that isn’t understood… for which science has no current answer… the religious answer is “God did it.” Case closed. From the origin of the universe to the intricacies of biological development, “God did it” is a common refrain heard from religious proponents. It’s not a real answer. It’s the religious way of saying, “I don’t know and I don’t care.” By attributing the cause to an invisible, all-powerful, undetectable entity, religion absolves its adherents from any investigative work… from any intellectual responsibility… from any curiosity. Religion teaches to not question authority. Probably every deistic religion teaches its adherents to not question authority, whether that authority be a minister, the bible, the Pope, or God. The bible is true. The Qur’an is true. The Book of Mormon is true. L. Ron Hubbard’s missives about Xenu are true (for the right price, anyway). All these religions make absolute claims on the truth. If these claims are questioned, the questioner is branded a heretic… a non-believer… an enemy of God. Obviously, some religions are more strict about this than others, but the truth claims are still the same. Question God’s motives when hundreds die in an earthquake and the likely answer is something about how He works in mysterious ways… that He has a plan… that all suffering is for a reason. In other words, it’s God’s will. Don’t question it. 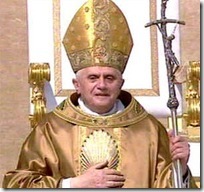 The Catholic concept of Papal Infallibility is a perfect example of discouraging the questioning of authority. Both Christian and Muslim religions claim that their holy books are the Word of God. In the case of the Qur’an, the claim is that the words (in their original Arabic) are the exact transcription of Allah’s words to Muhammad. If ever there was a demand to not question authority, that’s it. The problem is that questioning authority is, in my opinion, necessary for a healthy, honest society… especially when the authority figure is making claims of a questionable nature. That doesn’t mean that every time an authority figures makes a statement, he should be challenged. Questioning the skydiving instructor when he says to pull the cord to open the chute probably isn’t prudent. Questioning the priest who says that 10% of your income has to go to the church because God needs your money… that’s a different matter. 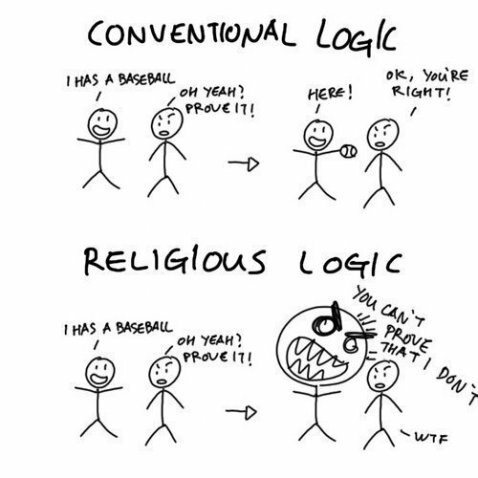 Religion teaches a twisted concept of evidence and logic. Another response about claims of Jesus’ divinity is the “Lord, Liar or Lunatic” argument (“Lewis’s Trilemma” originally popularized by C. S. Lewis). Logically, it’s flawed, yet I’ve heard it used multiple times in religious discussions that I’ve had in the past year… with complete sincerity. These are just two examples of how religion twists the ideas of logic and evidence. “Trees are beautiful” is not evidence. Lewis’s Trilemma is not logical. Most of the apologetic arguments for the existence of God have huge gaps in logic (ontological, cosmological, etc). The fact remains that no actual evidence exists to support the existence of God, yet defenders of religious faith will present heaps of what they claim is evidence… because they don’t seem to understand what evidence really is. The fallback argument is, of course, that it’s just a matter of having faith… which is no evidence at all. Religion promotes narcissism and self-righteous superiority. Narcissism and a self-righteous feeling of superiority are byproducts of any religion that claims to be the only true religion. Teaching adherents that they are special because they alone hold the truth and they alone will be saved by an all-powerful god and that they alone are holy in the eyes of that god is a surefire way to create a feeling of supremacy. Teaching that humans are a special creation of an omnipotent creator who watches over them with love and mercy is a surefire way to generate strong feelings of narcissism… especially if the creator is the “right” creator. The narcissism and feeling of superiority create, maintain, and worsen divisions among people of differing beliefs. “I’m better than you” doesn’t make for strong relationships. Hand in hand with the previous point is the point that religion advocates intolerance… partly because of the previous point, but also because some religious tenants explicitly promote intolerance. Islam makes the news on a regular basis for this, but Christianity is no slouch, either. From homosexuality to sexism to disbelief, religions have forbidden people for breaking the (ever changing) rules and have condemned, damned, and killed people for doing so. And even though we don’t live in medieval times, most religions still do at least some of those things. The nature of the major holy books is that they can be read, interpreted, and cherry-picked to back up almost any position imaginable… not just love and kindness, but also slavery, racism, pedophilia, bigotry, discrimination, murder, genocide, and a host of other positions that, without the holy books, would be not only morally reprehensible, but virtually unthinkable (they’re still morally reprehensible, but sadly, all too thinkable). If a religion’s tenants say that unbelievers should be killed or that people who don’t follow the rules will be tortured for all eternity or that women are inferior or that homosexuals are abominations, it doesn’t leave much room for tolerance and kindness. Those religious people who are tolerant and loving cannot espouse all the teachings of their religion. They must, in order to maintain their faith, cherry pick certain parts of the bible and follow certain parts of the church’s teachings while rationalizing away other parts or ignoring them altogether. Taking religious teachings as a whole would put them in an untenable position. I’ve written about this before but it bears repeating… often. Religion, particularly versions of Christianity, certainly do not promote moral behavior. Sure, Christianity offers the whole “carrot and burning-in-hell-for-eternity stick” scenario for encouraging good behavior (which is morally questionable on its own), but based on Christian principles, you can ignore the carrot for as long as you like and simply ask for forgiveness later… with no consequences. That’s about as far as you can get from encouraging moral behavior… to the point of implicitly condoning immoral behavior. 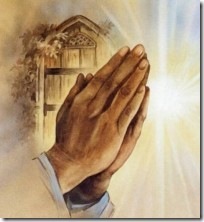 Of course, if you don’t ask for forgiveness and place your faith in Jesus, then you get the fiery pit… forever. Interestingly enough, Islam doesn’t teach eternal punishment. There’s a “Hell” if you will, but it’s not eternal. It seems that, in this particular case, Islam is a much more merciful religion than Christianity. In Islam, simply asking for forgiveness doesn’t get you out of the punishment, either, so it lacks Christianity’s flaw in that regard. Of course, that doesn’t free it from its own promotion of immorality, including debasing women and pedophilia. Religious rules can frequently be irrelevant or immoral in their own ways as well, and if you add multiple interpretations and cherry-picking to the mix, things get even more muddied. Certainly, you can dig out some gems of wisdom and kindness from religious doctrine, but you have to work through mountains of rubbish to find them. Sometimes bumper sticker wisdom says it all. Say what you will about the debate on whether religion and science are compatible, the main opponents to scientific research are bible-thumping members of fundamentalist religions. They will deny scientific data, no matter how overwhelming, if it conflicts with their ancient dogma or challenges their ideological loyalties. From the time of Galileo to present day arguments about evolution and global warming an stem cell research, the people on the front lines of denialism are almost exclusively hyper religious. Evolution versus creationism is probably one of the most publicized debates in this regard. The creationists want their mythology taught in science classes even though it isn’t science by any stretch of the imagination. They’ve tried to couch it in scientific language, calling it “Intelligent Design,” but it’s no more scientific with it’s fancy name. They reject factual data about the age of the universe, the age of the Earth, the age of fossils, the process of evolution, the effects of natural selection, and the unequivocal lineage of humans from ape-like ancestors. Some of that can be credited toward a belief in a 6,000 year old Earth, but much can be credited to the narcissism addressed earlier. How can a religious believer admit that humans are just the most recent product of the evolutionary process and not a special creation of a loving, caring, all-knowing god? If the holy books are supposed to be true, contradictory facts must be eliminated… either by ignoring them or attempting to discredit them. Religion is a self-perpetuating hindrance to honest, ethical, and yes, moral living. Despite a religious influence, many people still maintain just such a life… by compartmentalizing their beliefs, cherry-picking which doctrines to follow (“cafeteria Christians”), or simply ignoring doctrines altogether in favor of simply calling themselves “spiritual.” Those who lead a good and moral life do so not because of religious teachings, but because of an innate sense of morality combined with societal norms defining appropriate behavior. 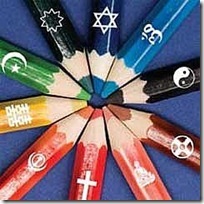 Religion clouds the issue of morality… and many other issues. The disadvantages far outweigh the benefits. The promotion of perpetual ignorance is reason enough for religion to be abandoned. Sadly, that probably won’t happen in my lifetime. Religion doesn’t need the truth. It needs followers. Good news from the NCSE! Two anti-evolution bills have been struck down in South Carolina this week. Both bills died in committee, which is exactly what should happen to all such bills in any state. Both bills were sponsored by Senator Michael Fair (R-District 6), who spearheaded a number of previous antievolution efforts in South Carolina. Senator Fair needs to give it a rest and stop wasting the taxpayers’ money with his shenanigans. From evolution to vaccinations to global warming, something I encounter on a regular basis while researching articles for this blog is denialism, rejecting the scientific evidence in favor of an alternative… an alternative which could be anything from pure woo to scientific-sounding arguments: “Just have faith” to “irreducible complexity.” Denialism is something that invariably causes a collective sigh an eye roll from the skeptic community because logical and fact-based responses seem to have no effect on denialists. An article from the European Journal of Public Health defines denialism as “the employment of rhetorical arguments to give the appearance of legitimate debate where there is none, an approach that has the ultimate goal of rejecting a proposition on which a scientific consensus exists.” The article goes on to identify five common characteristics of denialism. I’ve seen all of these “in the wild,” but items one through three are the ones I see most often. MacKenzie also adds a sixth characteristic. In the New Scientist piece, MacKenzie looks at the “why” of denialism. This depressing tale [about swine flu] is the latest incarnation of denialism, the systematic rejection of a body of science in favour of make-believe. There’s a lot of it about, attacking evolution, global warming, tobacco research, HIV, vaccines – and now, it seems, flu. But why does it happen? What motivates people to retreat from the real world into denial? Her approach uses a softer glove than many skeptics use, avoiding outright condemnation of deniers but instead making an attempt to understand how denialism spreads: identifying common characteristics, tactics (above), causes, motives, and possible solutions. The most notable common characteristic that MacKenzie defines is this. All [denialists] set themselves up as courageous underdogs fighting a corrupt elite engaged in a conspiracy to suppress the truth or foist a malicious lie on ordinary people. I can anecdotally confirm that statement, both in my personal life and in my readings. Where MacKenzie goes after that is to a hypothesis that what really triggers denialism is a sense of loss of control… a hypothesis that seems a good fit to the major denialist issues. All denialisms appear to be attempts like this to regain a sense of agency over uncaring nature: blaming autism on vaccines rather than an unknown natural cause, insisting that humans were made by divine plan, rejecting the idea that actions we thought were okay, such as smoking and burning coal, have turned out to be dangerous. She goes on to explain that this position is not necessarily malicious or anti-science. They simply require a human reaction. It only requires people to think the way most people do: in terms of anecdote, emotion and cognitive short cuts. Denialist explanations may be couched in sciency language, but they rest on anecdotal evidence and the emotional appeal of regaining control. The origins of denialist claims are another matter, and MacKenzie talks about how many of the more prominent claims (tobacco, global warming) got their start with corporate backing, how deniers tend to attract other deniers, and how claims become politically and religiously charged. The European Journal of Public Health article isn’t as philosophical in its analysis of denialist motivations, but hits home nonetheless. Denialists are driven by a range of motivations. For some it is greed, lured by the corporate largesse of the oil and tobacco industries. For others it is ideology or faith, causing them to reject anything incompatible with their fundamental beliefs. Finally there is eccentricity and idiosyncrasy, sometimes encouraged by the celebrity status conferred on the maverick by the media. Whatever the motivations (personal, political, financial, etc), the one thing that remains true among denialist claims is their distortion (or complete rejection) of the truth. For many issues, such as vaccinations and global warming, denialism has caused and will cause lives to be lost. 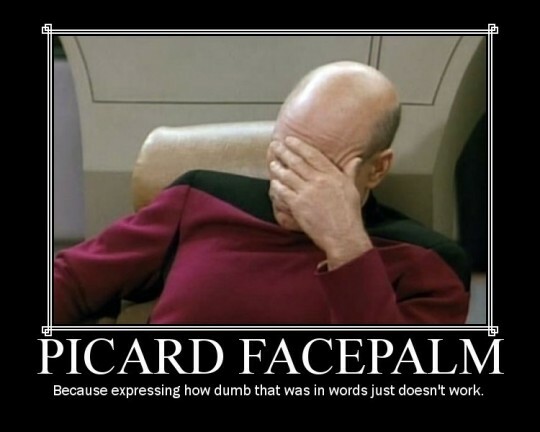 For others, such as the rejection of evolution, their positions simply contribute to the “dumbing down” of America. The frustration of dealing with most deniers is the almost impenetrable armor of ignorance they wear which deflects attempts at presenting actual evidence, be it factual or logical. They counter by trotting out any of the tactics listed at the beginning of this article, selecting the one that best fits the topic at hand. Cherry pick this evidence. Trot out this fake expert. Rage about this conspiracy theory. When all else fails, bring up Hitler. The Texas Board of Education, internationally known and mocked for its absurd battle against science, particularly evolution, has now worked over the social studies curriculum in a similar manner. They’ve been talking about it for awhile now… removing references to Thomas Jefferson and the like… but they finally too the vote and decided to go ahead with their plan to rewrite history in a way that more closely follows their strict ideological philosophy. The New York Times reports on the vote and what it means. Since Texas is one of the largest textbook consumers, publishers tend to follow Texas guidelines on what to include in their books. What that means is that students in other parts of the country will possibly have to deal with the consequences of the Texas BOE’s ignorance. The article mentions this influence, but also notes a bright spot. The board, whose members are elected, has influence beyond Texas because the state is one of the largest buyers of textbooks. In the digital age, however, that influence has diminished as technological advances have made it possible for publishers to tailor books to individual states. On one hand, it’s good that Texas won’t necessarily be foisting its idiocy onto the rest of the country. On the other hand, it’s a bit disconcerting that publishers would tailor their books to individual states. Does that mean that different states will teach a different “version” of history… or science… or math? There were no historians, sociologists or economists consulted at the meetings, though some members of the conservative bloc held themselves out as experts on certain topics. That fits the mentality of former board chairman Don McLeroy, who famously stated that someone needs to “stand up to these experts.” His thinking is fairly representative of the thinking of more than half the board. This is a group of right-wing, religious ideologues who want to force their twisted interpretation of reality onto our country’s children. Some of the more disturbing quotes from the article follow. The conservative members maintain that they are trying to correct what they see as a liberal bias among the teachers who proposed the curriculum. To that end, they made dozens of minor changes aimed at calling into question, among other things, concepts like the separation of church and state and the secular nature of the American Revolution. Interestingly, his contingent’s idea of the United States being formed based on Christian principles and favoring Christianity is nowhere in the Constitution, so it seems a little hypocritical for him to accuse his opponents of making stuff up. At least the “separation of church and state” is a valid interpretation of the First Amendment. 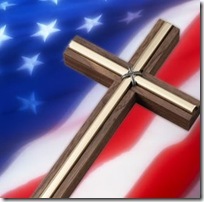 There is absolutely nothing in the Constitution about favoring Christianity. So they want McCarthy to be one of the good guys? Seriously? Wow. I’m wondering how David Bradley can justify that vote. These people are ideologically twisted religious fundamentalists who have no business deciding education standards. Their own educations seem to be monumentally lacking in any sort of reality-based concepts, whether relating to science or history. Their sole goal seems to be to shove their narrow-minded, right-wing, self righteous religious zealotry down the throats of children. Their goal isn’t to provide a decent education. Their goal is to self-perpetuate their divine ignorance. When a man is freed of religion, he has a better chance to live a normal and wholesome life.